Juno Lighting Down light new construction housing accommodates 3000K LED lamp with average life of 50000 hours to deliver light of brightness 900 Lumens. It has voltage rating of 120-Volts. This round shaped housing with 6-7/8-Inch cutout, features aluminum construction. It employs high transmission diffusing lens and high reflectance computer optimized reflector, which helps to achieve uniform aperture luminance. It has a dimension of 15-3/4-Inch x 9-1/8-Inch x 5-1/8-Inch. It uses 0 - 10-Volt forward phase and ELV dimming driver for reliable operation. 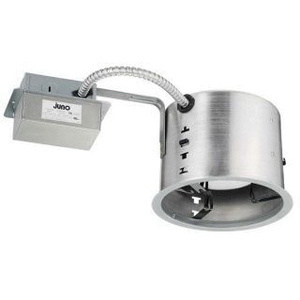 This recessed housing is compatible with 6-Inch lensed/open trim and supports easy mounting on 2-Inch thick insulated ceiling. It comes with 22-gauge die-formed galvanized steel mounting frame, pre-wired junction box, Real Nail® three bar hangers and push-in electrical connectors. Housing is UL/cUL listed, Energy Star certified and Title 24 compliant.